This article is about the historic Italian Army Alpine Brigade Tridentina. For the historic Italian Alpine Division, see 2nd Alpine Division Tridentina. The Alpini Brigade Tridentina was a light Infantry brigade of the Italian Army, specializing in mountain warfare. Its core units were the Alpini, the mountain infantry corps of the Italian Army, that distinguished itself in combat during World War I and World War II. The Tridentina Alpine Brigade carried on the colours and traditions of the WWII era 2nd Alpine Division Tridentina. 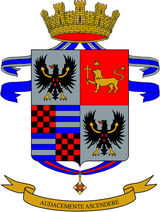 The brigade was based in the eastern half of the Italian province of South Tyrol. The headquarters was in the city of Brixen. 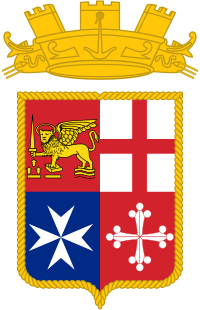 The brigade was disbanded in 2002, however the name and traditions were carried on by the newly raised Tridentina Division, a deployable military headquarters of the Italian Army, which in 2013 became again a full division. The Tridentina brigade was the first Alpini brigade to receive an Alpini Parachutist Platoon. 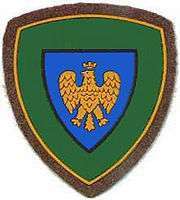 The platoon activated on 1 September 1952 in Brixen and on 1 April 1964 it merged with the other four Alpini Brigades Parachutist Platoons to form an Alpini Parachutist Company under direct command of the 4th Alpine Army Corps. 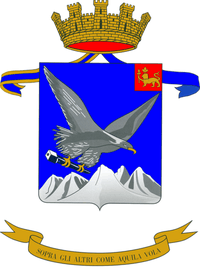 The 21st Frontier Defense Regiment was dissolved on 30 June 1964 with the exception of the Val Brenta Alpini Battalion, which absorbed the companies of the Val Leogra Alpini Battalion. The companies of the Val d'Adige Alpini Battalion were transferred to the Val Cismon Alpini Battalion of the Alpine Brigade Cadore. 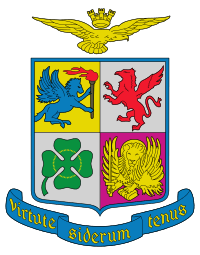 In 1975 the Italian Army abolished the regimental level and battalions came under direct command of the Army's brigades. In the same year the Verona Mountain Artillery group was dissolved and the 1st Heavy Artillery Group Adige moved in the vacant base in Elvas. The Adige along with the United States Army's 11th Field Artillery Detachment, based at Site Rigel in Naz-Sciaves, were tasked, in case the defense of the Puster Valley would fail, to destroy the entire valley with W33 nuclear artillery warheads fired from the Adiges M115 203mm howitzers, as part of the US-Italian nuclear weapons sharing program. After the 1976 reform, the 4th Alpine Army Corps was responsible for defending the Italian border along the main chain of the alps from the Swiss-Austrian-Italian border tripoint in the west to the Italian-Yugoslavian border in the east. In case of war with Yugoslavia, the 4th Alpine Army Corps would remain static in its position guarding the left flank of the Italian V Corps, which would meet the enemy forces on the plains of Friuli-Venezia Giulia. The only brigade which would have seen combat in such a case would have been the Julia. In case of a war with the Warsaw Pact, the 4th Alpine Army Corps had two war plans: one in the case the Soviet Southern Group of Forces and Hungarian Army would march through Yugoslavia and the other in case the Warsaw Pact would violate Austrian neutrality and march through Austria. In case the enemy forces would come through Yugoslavia, the Julia would cover the mountainous left flank of the 5th Corps, which, with its four armoured and five mechanized brigades, would try to wear down the enemy before it could break out into the North Italian Padan plain. The other Alpini brigades would remain static. In the more likely case, the Soviet and Hungarian divisions would invade Austria, march through Southern Styria, and through the Drava valley in Carinthia, the Alpini brigades would have been the first front line units of the Italian Army. The Julia would have defended the Val Canale, the Cadore, and the Piave valley, while the Orobica had a special mission, and the Taurinense would remain in reserve. The Tridetina was tasked with defending the Puster valley at all costs. 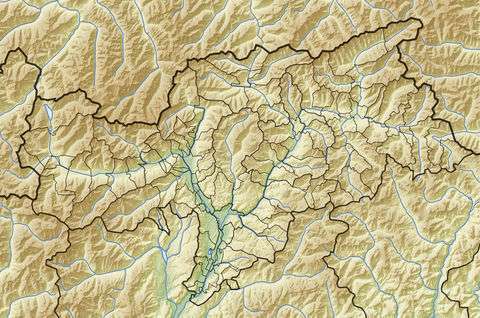 Connected by a low pass to the Drava valley, the Puster valley ends near Brixen, and a Soviet breakthrough to Brixen would have cut the important line of communication between the Italian Army and NATO's Central Army Group in Southern Germany over the Brenner Pass. Furthermore, from Brixen Soviet forces could turn northwards and take the Central Army Group at its back or they could turn southwards through the Adige valley to reach Verona and take the Italian 5th Corps at its back. Therefore, the Tridetina was the second strongest Alpini brigade. It manned four lines of defence in the Puster valley and the 4th Alpine Army Corps had an armoured and a mechanized battalion, as well as the 4th Heavy Field Artillery Regiment and a self-propelled artillery group in reserve to support the Tridetina. 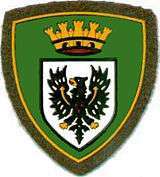 Furthermore in the village of Elvas near Brixen the 1st Heavy Artillery Group Adige was based. The Adige group was armed with M115 howitzers and during peacetime part of the 3rd Missile Brigade Aquileia. 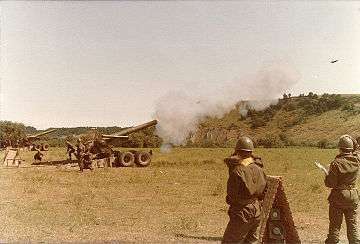 In case of war the group would have supported the Tridentina with artillery fire, but if a Soviet breakthrough was imminent the Adige would have plastered the Puster valley from beginning to end with W33 nuclear artillery shells, which were stored in the village of Naz at "Site Rigel" by the 11th US Army Field Artillery Detachment. The Adige group had two firing batteries with 4 artillery systems per battery and 140 (!) nuclear artillery shells to fulfil its task. 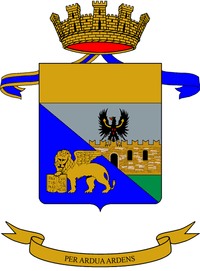 After the introduction of the MGM-52 Lance tactical surface-to-surface missile system in the 1980s the 1st Heavy Artillery Group Adige was disbanded on 31 July 1982 with its 8th battery joining the 9th Heavy Artillery Group Rovigo as 3rd "Wolves of Elvas" Battery. The Rovigo itself lost its nuclear capability in 1986 and in the same year the US Army left "Site Rigel". As the fortifications manned by the 264th Alpini Company were in the area of operation of the Cadore Alpine Brigade information about the 264th Company can be found at the Cadore article. On 23 August 1986 the Val Brenta, with the exception of the 262nd Alpini Company, was disbanded and the bunkers stripped of their equipment. 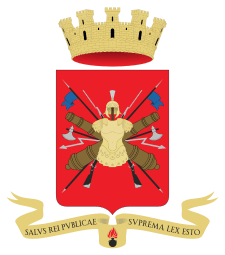 The 262nd Alpini Company was disbanded in 1991. 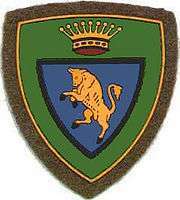 The brigade and its last remaining units were dissolved on 31 December 2002. On the next day the Tridentina Division Command was activated in Bolzano which carries on the traditions of the 2nd Alpine Division Tridentina and the Alpine Brigade Tridentina. Together with the Friuli Division and the Acqui Division the Tridentina will come directly under the Armys Operational Center (Centro Operativo dell’Esercito or COE) once COMFOTER has been disbanded. ↑ Esercito Italiano: Il Comando Divisione "Tridentina"
1 2 Esercito Italiano: Il Comando Divisione "Tridentina"